The International Standard Book Number (ISBN) is a unique numeric commercial book identifier based upon the 9-digit Standard Book Numbering (SBN) code created by Gordon Foster, Emeritus Professor of Statistics at Trinity College, Dublin, for the booksellers and stationers W. H. Smith and others in 1961.
International Standard Book Numbers issuance is country specific, and is tailored for each country's national goals. In Canada the stated purpose of issuing International Standard Book Numbers for no cost was to encourage Canadian culture. In the United Kingdom and United States apparently the issuing of International Standard Book Numbers has become a profit center for the companies involved. Whether or not any of the profits accrue to the taxpayers is not known. Australia: In Australia ISBNs are issued by the commercial library services agency Thorpe-Bowker, and prices range from $A40 for a single ISBN (plus a $A55 registration fee for new publishers) through to $2,750 for a block of 1,000 ISBNs. Canada: In Canada Library and Archives Canada, a government agency, is the responsible entity, and there is no cost. United Kingdom and Ireland: In the United Kingdom and Ireland the privately held company, Nielsen Book Services, part of Nielsen Holdings N.V., is the responsible entity, and there is a charge. ISBNs are sold in lots of ten or more. United States: In the United States the privately held company R. R. Bowker is the responsible entity, and there is a charge, which varies depending upon the number of ISBNs purchased, with prices ranging from $125.00 for a single number. 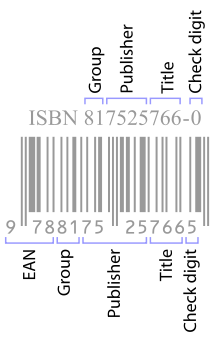 Publishers and authors in other countries need to obtain ISBNs from their local ISBN Agency. A directory of ISBN Agencies is available on the International ISBN Agency website. 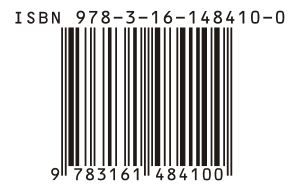 The 2001 edition of the official manual of the International ISBN Agency says that the ISBN-10 check digit – which is the last digit of the ten-digit ISBN – must range from 0 to 10 (the symbol X is used instead of 10) and must be such that the sum of all the ten digits, each multiplied by the integer weight, descending from 10 to 1, is a multiple of the number 11. Modular arithmetic is convenient for calculating the check digit using modulus 11. Each of the first nine digits of the ten-digit ISBN – excluding the check digit, itself – is multiplied by a number in a sequence from 10 to 2, and the remainder of the sum, with respect to 11, is computed. The resulting remainder, plus the check digit, must equal 11; therefore, the check digit is 11 minus the remainder of the sum of the products. Thus the check digit is 2, and the complete sequence is ISBN 0-306-40615-2. The value required to satisfy this condition might be 10; if so, an 'X' should be used. ^ "Bowker -- ISBN". Thorpe-Bowker. Jan 5, 2009. http://www.thorpe.com.au/en-AU/products/servident_isbn.shtml. Retrieved March 29, 2012. ^ Friedlander, Joel (May 19, 2010). "Bowker's Andy Weissberg on ISBN and the Future". The Book Designer. http://www.thebookdesigner.com/2010/05/bowkers-andy-weissberg-on-isbns-and-the-future-of-the-book/. Retrieved February 12, 2011. This page was last modified on 14 July 2012 at 19:50.